Will it break? How long will it last? How will it sound? How do temperatures affect performance? These are the types of product performance questions that designers and engineers answer with the multiphysics simulation software from the SIMULIA brand of Dassault Systèmes. Lori Bonynge, Director of SIMULIA Innovation Lab will share details about SIMULIA, its expansion to include structural, fluids, and electromagnetics simulation, as well as how customers use 3D simulation to analyze and improve the real-world performance of their products, including wind turbines, airplanes, cars, shoes, cellphones, medical devices and more. Dassault Systèmes SIMULIA is located in the Northwoods business campus in Johnston Rhode Island. Their 350 Rhode-Island based employees are involved in software development, IT services, customer support, project planning, finance, and marketing. 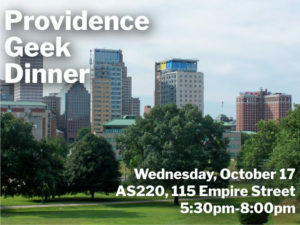 Join us at Providence Geeks to learn about their research and development activities related to their multiphysics simulation, cloud computing, and also experience hands-on 3D immersive virtual reality demos. The event itself is FREE! Beverages and food are for sale at AS220’s excellent bar and restaurant. Doors open at 5:30pm. Socializing, eating and drinking up until the 15-minute presentation/Q&A around 6:30. Afterwards, back to socializing, eating, drinking. It’s totally casual. Wear whatever, bring whomever, arrive and take off whenever! And don’t worry about eating or not – come famished or full – eating is optional. One more thing: we’ve got a Slack team. If you’d like to join, follow this link. Here at Providence Geeks, we’re all about choice. You can RSVP at Facebook, Meetup, or truth be told, just show up. Your RSVP helps us know in advance how many people to expect, but RSVPing is not mandatory.